Acai Berry 10:1 extract, Acai Berry Freeze Dried Powder, Organic Moringa Oleifera Powder, Capsule: Hydroxypropyl Methylcellulose (HPMC) (Vegetarian), Beetroot Powder, Anti-caking Agent: Magnesium Stearate (Magnesium salts of fatty acids) (vegetable source), Pomegranate 12:1 extract (40% ellagic acid), Resveratrol 98%, Zinc Citrate Powder, Vitamin B6 Pyridoxine Hcl, Grape Seed Extract, Vitamin B7 D-Biotin. USAGE GUIDELINES: 1 capsule to be taken 2 to 3 times per day, with or without food. More capsules can be taken if required. This superfood supplement contains antioxidants (including anthocyanins), which offer cells protection against free radical damage and support the body’s own natural defence systems. Also rich in vitamins, minerals, phyto-nutrients and polyphenols, Acai Immuno Defence offers all-round support for energy, immunity, health and vitality - ideal for slimmers, athletes, diabetics and anyone that is generally health-conscious. they help to keep blood sugar levels stable. 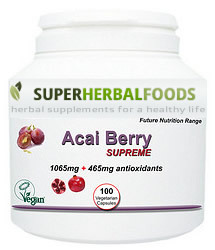 In this new formulation we have gone a step further by adding 3 other powerful & nutrient rich antioxidant herbals i.e. resveratrol, grape seed extract and pomegranate! Acai berry: Acai berries have rapidly grown in popularity over recent years, largely because they have been recognised in the Western world as being a superfruit. Found only in the Amazon rainforests of Central and South America, these berries contain a wide array of vitamins, minerals, essential fatty acids and antioxidants. Natives of the Amazon have been enjoying their nutritional benefits for many years. In fact, for three traditional Caboclo populations in the Brazilian Amazon, acai berries make up a major component of their diet - up to 42% of the total food intake by weight. This fact reflects their high nutrient content. Acai berries are also beneficial for: • the immune system: their dark purple pigment contains plant chemicals called anthocyanins (powerful antioxidants that are part of the flavonoid family of molecules and are important for neutralising harmful free radicals) • supporting the heart: acai berries are a rich source of protein and dietary fibre, which are believed to have a protective effect on the cardiovascular system • lowering cholesterol levels: acai berries are a rich source of Omega 6 and Omega 9 fatty acids, as well as phytosterols, which play an important role in lowering the levels of cholesterol in the blood. Other health benefits of acai berries include their antibacterial, anti-inflammatory and anti-mutagenic properties. Moringa oleifera: Moringa oleifera is the most widely cultivated species of the genus Moringa, which is the only genus in the family Moringaceae. Common English names include: moringa, drumstick tree (referring to the appearance of the long, slender, triangular seed-pods), horseradish tree (referring to the taste of the roots), ben oil or benzoil tree (referring to the oil which is derived from the seeds). It is a fast-growing, drought-resistant tree, native to the southern foothills of the Himalayas in north-western India, and widely cultivated in tropical and sub-tropical areas where its young seed pods and leaves are used as vegetables. Many parts of moringa are edible, including: the immature seed pods, leaves, mature seeds, oil pressed from the seeds and the flowers. The leaves are the most nutritious part of the plant, containing B vitamins, vitamin C, provitamin A as beta-carotene, vitamin K, manganese, and protein, among other nutrients. The immature seed pods, called "drumsticks", are commonly consumed in South Asia. They contain vitamin C, dietary fibre, potassium, magnesium, and manganese. The seeds, sometimes removed from more mature pods and eaten like peas or roasted like nuts, contain vitamin C, B vitamins and dietary minerals. Mature seeds yield 38–40% edible oil called ben oil from its high concentration of behenic acid. The refined oil is clear and odorless and resists rancidity. The roots are shredded and used as a condiment with sharp flavour qualities, as a result of their high polyphenol content. Pomegranate: Native to Iran, the Himalayas and northern India, the pomegranate is high in vitamins A, C, E and iron, and is often referred to as a “fruity panacea” because of its numerous health health benefits. It is an important traditional remedy in many ancient systems of medicine; in Ayurvedic medicine, for example, the rind of the fruit is used against diarrhoea, dysentery and intestinal parasites. It is now known that the rind contains ellagitannins that are anti-bacterial, anti-viral, anti-parasitic, anti-inflammatory and astringent. The medicinal applications of pomegranate, known to ancient medical systems for centuries, are now being validated through empirical evidence gleaned from scientific investigation. In recent years, a number of studies have surfaced which describe the therapeutic uses of pomegranate in areas such as rheumatology and cardiology. For instance, the anti-inflammatory properties of pomegranate polyphenols have been shown to offer protection against atherosclerosis and cardiovascular disease. Many cosmetic preparations also include pomegranate polyphenols, because they have been proven to protect the skin from sun damage and to promote the production of collagen. Resveratrol: Found in the skin of red grapes and in other fruits, but derived primarily from Japanese knotweed, resveratrol (3,5,4'-trihydroxy-transstilbene) is a stilbenoid - a type of natural phenol - and a phytoalexin produced naturally by several plants when under attack by pathogens, such as bacteria or fungi. Resveratrol was initially mentioned in a Japanese article in 1939 by M. Takaoka, who isolated it from the poisonous but medicinal Veratrum album, variety grandiflorum. However, it attracted wider attention only in 1992, when it was suggested as the explanation for the cardioprotective effects of wine. The full effects and health benefits of this powerful antioxidant are currently a topic of numerous studies. In experiments to date, anti-inflammatory, blood sugar-lowering and other beneficial cardiovascular effects have been reported. Grape seed extract: Grape seed extract contains a wide array of beneficial constituents, such as protein, lipids, carbohydrates, polyphenols and high levels of proanthocyanidins, which are similar to flavonoids. It also supports heart health by protecting collagen, which is essential for healthy arteries. Studies have shown that the antioxidant power of polyphenols is 20 times greater than vitamin E, and 50 times greater than vitamin C, which makes grape seed extract an ideal means of protecting the body against oxidative and free radical damage. Some people call these polyphenols “nature’s biological response modifiers” because of their ability to help the body fight viruses, allergens, and carcinogens. That means that, among their many benefits, they exhibit anti-inflammatory, anti-allergic and anti-microbial activity. One particular type of phenol found in grapeseed is called procyanidin, which can support good vision, joint flexibility, the health of body tissues and strengthen capillaries and veins to help improve the circulatory system. Procyanidin is also thought to protect the body from premature ageing (by increasing vitamin C levels in the cells and scavenging for toxins so the organs can get rid of them) and to delay the oxidation of low density lipoproteins (the fats that are responsible for “bad cholesterol”).